Greek Revival/Traditional, 1848 On Jefferson Avenue, a stone’s throw from downtown Detroit and just across the street from Albert Kahn’s famous, The Palms, historic apartments, sits the prettiest little example of Greek Revival architecture you could ever hope to see. 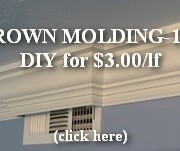 [This is part of my CROWN MOLDING-102 series.] 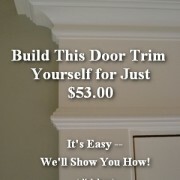 In this post I’ll show you how I installed the last three moldings that complete this large crown molding buildup.